We are thrilled that the print edition of Research Like a Pro: A Genealogist’s Guide is now available on Amazon! To preview the content of the book, read the blog posts in our Research Like a Pro series. Today I want to tell about the journey of writing the book. The content is similar to the Research Like a Pro study group, but will be available for those who want to work through the assignments at their own pace. Curious if the process would work as well for others as it had for me, I started the Research Like A Pro Study Group. The researchers ranged from those who had worked mainly on FamilySearch and Ancestry to others who were graduates of the Boston University genealogy program. By the end of the 12 week course, the success of the study group members told me I had something that needed to be shared. 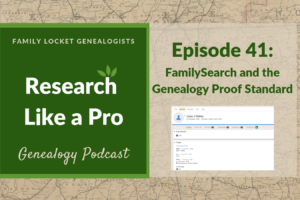 Nicole and I compiled the blogs posts and course material into a single format and titled it Research Like A Pro: A Genealogist’s Guide. Available only as an e-book for the first three months, we’re excited to launch the print version. If you’ve ever felt like you’re spinning your wheels as you jump from website to website this is the book for you. If you have long standing brick walls in your genealogy and don’t know what to do next, this is the book for you. If you know there’s a better way to research than your current process, this is the book for you. 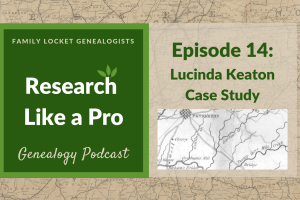 Research Like A Pro: A Genealogist’s Guide is a step-by-step method that guides you through each part of the research process. Each chapter includes examples from my own genealogy research and ends with a specific task. You’ll learn how to form an objective, review your research by creating a timeline analysis, construct a locality guide to direct your research, create a plan, style source citations, set up a research log to organize and track your searches, and write a report detailing your findings and ideas for future research. Work samples and templates give you the tools you need to be successful. We all have done it. Clicking from website to website, looking for the one record that will solve our family history conundrum. Unfortunately, that approach just leaves us exhausted and feeling overwhelmed. Focusing in on a specific objective then following the Research Like A Pro process will keep you on track and at the end of the project, you’ll know where you’ve looked, what you’ve found, and what to do next. You work at your own pace. Start with a relatively small project and learn the process, then start again with a new project. Each time you follow the steps you’ll boost your research skills. There are a lot of ways to participate in the Research Like A Pro community. With the purchase of the book, either the electronic or print version, you’ll be eligible to join the secret Research Like A Pro Facebook group. Get assistance from Nicole and me as well as other group members as you work through the process. If you’d like more accountability, join one of the study groups that will start in September. You’ll have eight interactive webinar presentations, assignments, and feedback on each assignment. Watch for the Research Like A Pro e-course coming soon. You’ll be able to view all the webinars and work through the assignments at your own pace. However you like to learn, we can help! What are you waiting for? It’s time to Research Like a Pro! I’ve purchased the ebook how to I get to the secret Research Like A Pro Facebook group? Crystal, If you email your receipt to Nicole at nicole@familylocket.com she will add you to the group. I’m looking forward to meeting you there! My print copy of the book arrived yesterday. I love it, of course! I have the ebook, but I still love to cuddle a paper book. I participated in the RLP study group, so why did I purchase the book? Because it is hard to break 20+ years of bad habits! I still occasionally find myself falling into my old ways and have to rein myself in. 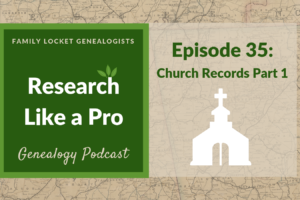 I use the “Research Like a Pro: A Genealogist’s Guide” to bring myself back on track and to stay on track for the remainder of that project. The print copy of the book will remain by my computer in plain sight as a reminder to not jump down those rabbit holes. I am a shut in and no longer able to go on research trips, even to local family history places or libraries. Before I purchase you book, “Reseach Like a Pro,” it would really help to know if there is a lot of tips for people like me or a lot for those who can go out to research. Thanks for the question! Yes, the book will definitely help you. I do much of my research right from home. With more and more records being digitized, it’s amazing what we can do with online sources. The book will give you lots of tips that will help you make progress with your research. Thank you so much for the reply. I actually ended up ordering it today to take a chance. Am looking forward to starting it. I keep getting sidetracked with my research and definitely need to be more organized! Great news! Enjoy and let me know how it’s helping.